ChrisCross will be at NYCOMICCON! I’m talking about me in third person again. I will be there signing with the guys at Valiant Entertainment for my stint on BLOODSHOT 0 and most likely some future work that I’m partaking as I type this. There is much to talk about and a lot to catch up on and i will endeavor to keep up the pace in creating these posts. 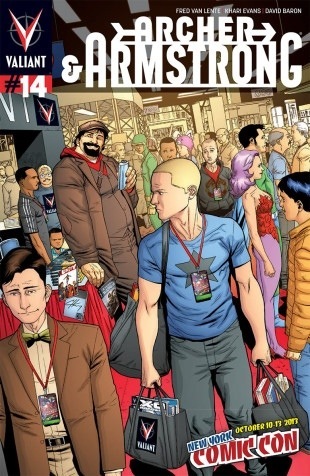 If you’d like to catch me at the Con, the booth number for Valiant is Booth #2028 inside the Javitz Center in Midtown Manhattan – and they’re bringing along a boatload of exclusive giveaways, all-new convention-only items, and superstar talent to celebrate their biggest NYCC ever!! I hope to see you guys there because i will be making the rounds letting people know about my company website going live on SATURDAY. the company is named ETERNAL KICK and it will be out there for people to see FINALLY! And guaranteed Archer will be poking me trying to annoy me. Tah tah for for now, guys!! !